1 photograph : b&w ; 18 x 24 in. 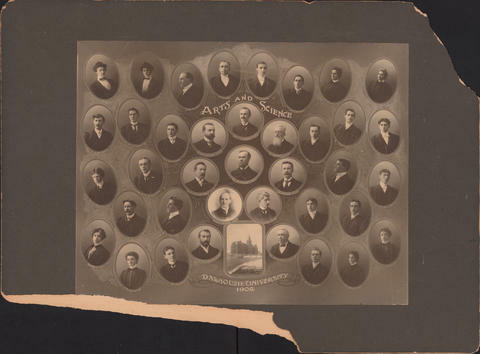 Item is a composite photograph of the Dalhousie University Arts and Science Faculty and Class of 1902. The photograph consists of portraits of C. MacDonald; A. J. W. Myers; B. L. Morrison; L. L. Thomas; R. H. Stavert; M. A. Lindsay; R. McL. Shaw; T. T. Fulton; T. C. Hebb; B. W. Coffin; D. J. Nicholson; L. A. Richardson; A. M. Rand; J. L. Wilson; E. MacKay; J. Leichti; G. H. Christie; W. C. Murray; J. Forrest; S. M. Dixon; D. A. Murray; H. Murray; A. MacMechan; I. B. Howatt; J. F. Rielly; M. E. Stuart; J. A. Cann; L. A. DeWolfe; E. M. Fleming; W. G. MacKeen; W. R. MacKenzie; G. H. Sedgewick; C. V. Christie; F. S. Vance; R. A. Bentley; J. B. Campbell; and K. F. Mackenzie arranged in several rows with a photograph of the Forrest Building. Upper right and bottom left corners of the photograph's matboard are missing.